It is amazing to sit down and write about a boot I have become so fond of over the last year. The Axon was Garmont's new addition to the beefy freeride line and is Dynafit compatible. The big boot skied with precision and feel, while the uphill was smooth and easy with the Dynafit bindings. The Axon is a bit heavy at 9 lbs. a pair, but the comfort, durability, and stiffness all make up for the weight. One of the best features of the boot is the durability. I skied on the boot over 40 days last winter and spring and the shell and sole have stood the test of time. From short trips up and down the Dragon Tail Couloire in Rocky Mountain National Park to the longer spring tours on Drift Peak, these boots always seemed to be the perfect model for me. The liner is greatly improved over the prior year and fills the boot out nicely. Remember to get the liner professionally formed for a great fit and lasting comfort. Colorado Mountain School has been using Chuck Bird at Neptume Mountaineering here in Boulder Colorado and we can not say enough great things about him. 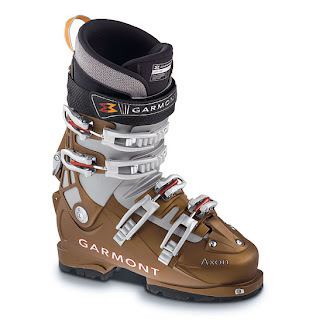 Please let me know what you think of the Axon boot and I look forward to sharing with you a review of the new Garmont Radium and Black Diamond Factor boots. Both of these use the new (for AT) overlap construction for added stiffness and lighter weight. Also stay tuned for a review of the new Black Diamond Push Telemark Boot. Do you know if the Axon have another solution for the joint? The one on the Endorphin is to weak in my opinion. Your blog is very nice & informative. I always appreciate your work. Thanks to the sharing.I am so glad to hear that you are settling in and enjoying your new surroundings.